Swedish Ironman distance record holder Clas Björling travels  a lot  so he should know what works best when transporting his bike. "As a professional triathlete I travel all over the world for competition and training. It's important to arrive with my equipment intact, and the design and strength of the Crate Works bike box always makes sure that happens. The three sports require a lot of gear, and with the airline's weight restrictions every pound counts and that's also one of the reasons I use this light box." Crate Works Transport Systems come in three models. The PRO1 is made of double-wall corrugated cardboard and is the strongest corrugated-cardboard bicycle box on the market. The PRO1 boasts Crate Works rigid CORR-X® Frame Plate, numerous tie downs, reinforced handholds, foam chocks and an H-Strap System for additional support. When not in use, the box is fully-collapsible for easy storage. MSRP is $109. The PRO XLC is constructed of corrugated plastic, which is stronger than cardboard but still lightweight and durable, and will stand up to constant abuse when shipped via the airlines. The PRO XLC boasts the same features as the PRO1 and retail for $169. At $329 MSRP, the Pro XL-TC is the most affordable tandem bike box available that also works for most recumbent bikes. Made of Corr-X Corrugated Plastic the box is lightweight, strong and, like the PRO1 and PRO XLC, can be used for multiple transports. Says Björling: "I've been using my Crate Works box for three years and even with all the travel and abuse, it's still in great shape. Thanks Crate Works for making my life as an professional athlete easier. Dealer discounts (net 15 after first sale). Product usually ships within 48 hours of order. Lighter than other hard shell cases for easer traveling and handling. All parts replaceable through Crate Works (no need to buy a new box when only one item needs to be repaired). Free Crate Works brochures for in-store distribution. 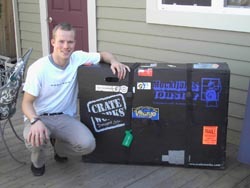 "When people think of cardboard bike boxes they usually think of those flimsy boxes that manufacturers use for one-time bike shipments," says Steve Thompson of Crate Works. "Crate Works Transport System boxes are made of stronger materials  either double-wall corrugated cardboard or corrugated plastic  that are designed for multiple uses. IBDs are extremely satisfied with selling our products to their customers." For more information about Crate Works Transport Systems call 1-800-934-5214 or log onto the Internet at www.crateworks.com. Crate Works designs and manufactures the lightest, most durable corrugated cardboard and corrugated plastic bicycle transport boxes on the market. For unsolicited testimonials go to www.crateworks.com.